Both men and women would like there to be more forms of male birth control available, a new survey suggests. Only four out of the 18 forms of contraceptive are for male use. And the birth control methods used by women – such as the pill, sterilization and intrauterine devices – are by far the most popular forms. In recent years, there has been a renewed push for the development of male birth control, such as a patch, a shot and a hormonal pill. So far, most attempts have been cut short due to side effects that some balk are no worse than what women on approved forms of birth control experience. 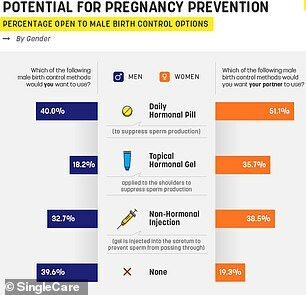 Yet the new Singlecare survey of nearly 1,000 people shows that more than a third of men and over half of women are ready for men to shoulder or at least share the responsibility for birth control. Currently, 62 percent of women in the US are using contraception, according to the Centers for Disease Control and Prevention (CDC), and all but one percent have used it at some point in their reproductive lives. And some 60 percent of single men consider themselves the bearers of birth control – mostly in the form of condoms – according to a 2017 CDC survey. But condoms have a much higher failure rate and are not long-term use unlike many forms of female contraception. According to the new survey from Singlecare, men are willing to step it up and take on more responsibility for preventing pregnancy. The favored prospective form of male birth control would be a daily hormonal pill that would stop or reduce sperm prodcution. Half of women said they would like their male partners to take such a pill, and 40 percent of men said they wanted to use the same. A non-hormonal shot into the scrotum was the second most appealing male contraceptive to both genders, with 32.7 percent of men and 38.5 percent of women saying they would choose the injection. It may be the least invasive option, but the topical hormonal gel currently in development did not garner much favor with men, and wasn’t particularly popular among women, either. Just over 18 percent of men said they would like to use this option, as did 35.7 percent of women. Men and women ranked these options in the same order, suggesting that, on the whole, they’re in agreement. The only exception in the survey’s findings was the ‘none’ option for birth control. 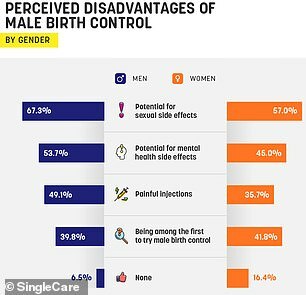 Nearly 40 percent of men said they’d want to use no birth control, while (unsurprisingly), just 19 percent of women said they would like for their partners to use none of the forms in development. Interestingly, many women did not want men to take on the full responsibility for contraception. 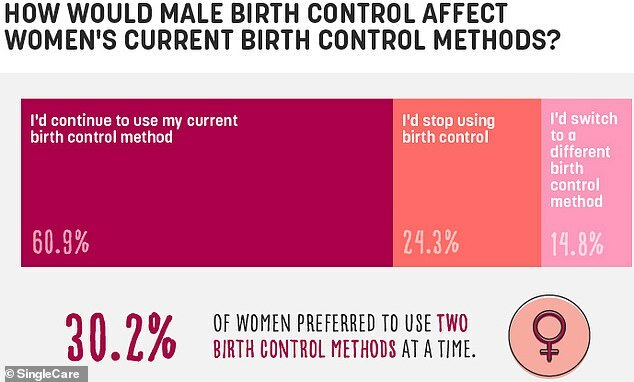 About 61 percent said that they would keep on using their same, current birth control method even if they had a partner using male birth control. And about a third of women said that they would want to use two forms of contraception simultaneously. Paradoxically, most men and women alike believed that the male partner could be trusted to reliably take a daily pill, but around one third of each gender also didn’t want men to be responsible for birth control. Since no male birth controls are on the market yet, the Singlecare survey asked participants about their fears over the shot, gel and pill. For both groups, the top fear was that male birth control could have sexual side effects. Over half of men were worried that contraception could negatively impact their mental health, and 45 percent of women shared that fear for their partners. 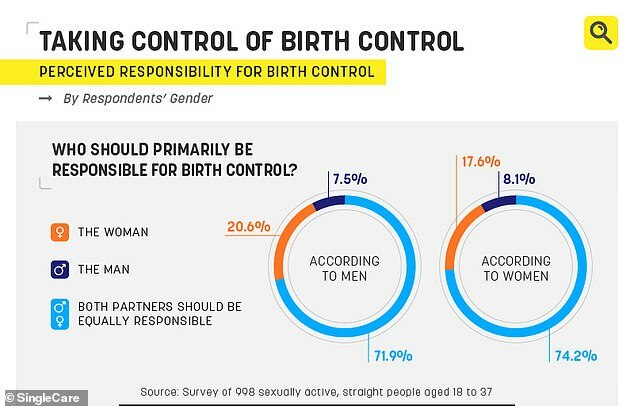 Despite these worries, about 74 percent of women and nearly as many men (71 percent) said that they think birth control should be a shared responsibility. 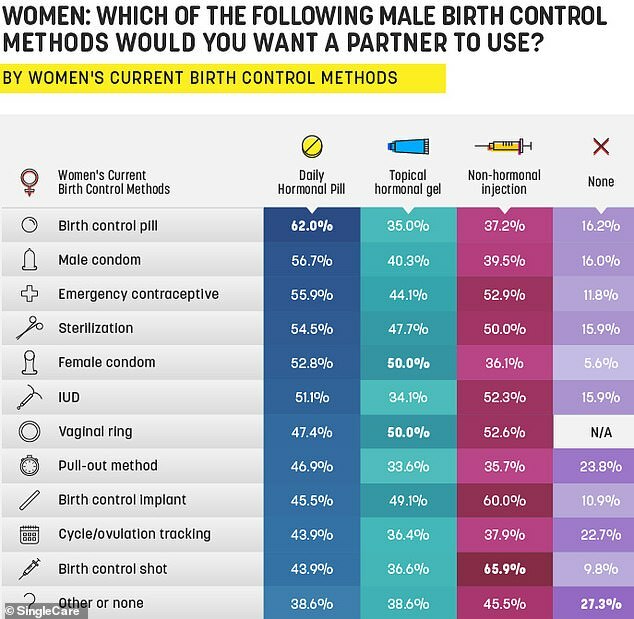 This suggests that if male birth control made it to the market, contraceptive products and use would actually more closely align with views of the people using them.